Sian Prior keeps her legs moving and her eyes on Australia's highest mountain range. After my heart took a trampling recently, a wise woman advised I should get out from under the quilt and look at the horizons. When an invitation arrives to go walking in the mountains, I take her advice in the hope that seeing some of the most spectacular horizons in Australia can help lighten my load. I pack a small case and drive with my friends Caroline and Charlie from Melbourne to Jindabyne. Just west of the town, along the Alpine Way, we check into an eccentric guesthouse named Bimblegumbie in the foothills of Mount Crackenback. "Great location for a chiropractic conference," Charlie says, trying to raise a smile from his quietest passenger. Established by owner Pru Parker in the late 1970s, Bimblegumbie (meaning "spear whistle" in a local indigenous language) began life as a small house on a tree-covered hillside. It has since grown to a rambling collection of one- and two-storey cottages dotted around a much-extended main lodge. Pet dogs are welcome in Bimblegumbie's landscaped gardens, where sculptures include a tower of rusted hanging chains and a tree covered with exotic masks. Wallabies graze on lush summer grasses here and a piano sits in an open shed, with a stool for those wanting to play for the wildlife. Behind the main lodge, overlooking the green valley below, Pru's companion, Craig, has placed a wicker chair. He has also stashed a couple of sets of binoculars in a nearby tree for better viewing; just one of many thoughtful touches. I stay in the Rose Room of the main house (deep-red and green walls); my friends in a small studio in the garden. Each day, Caroline consults maps and plans a walk for us while Charlie packs the lunches. On day one we drive towards Jindabyne, turn up Kosciuszko Road, past Perisher ski resort and on to Charlotte Pass in Kosciuszko National Park. We each don an extra layer of clothing to combat the alpine wind before setting off for Blue Lake. A paved path leads down a steep hill towards the Snowy River. In spite of the summer sun, there are luminescent puddles of snow on distant peaks. Purple, white and yellow wildflowers grow beside the path as if strewn from a giant's basket. Crossing wobbly rocks over the river, we begin the steep ascent towards Carruthers Peak. My lungs are soon protesting but I ignore the fatigue - this walk is exactly the treatment they need. When you're inhaling this deeply, there's simply no energy left for rumination and regret. We stop to watch some children sliding down a patch of remnant snow beside the track before we descend to Blue Lake. With clouds piling up overhead, the lake is more slate-grey than azure. A couple of giant granite rocks provide a windbreak as we have lunch and listen to the water rushing from the lake to the river. Then we follow the river until we reach another body of water, Hedley Tarn, where patient birds dive for trout. When Charlie suggests we cut across country to rejoin the return track above Blue Lake, I am nervous but, after carefully checking the map, we decide to embrace the challenge. I try to think about fearless Charlotte Adams - the first white woman to climb Kosciuszko and for whom Charlotte Pass is named - as we pick our way across lichen-stained boulders, marvelling at the variety of cushiony grasses and reflective pools of melted snow around us. My anxiety melts, too, and I can even summon a smile when Charlie points out a rock shaped like an American Indian's face, complete with feathered headdress. By the time we reach the return path, my lungs feel expansive enough to try a spot of yodelling. On day two we drive to Thredbo village and take the chairlift to the mountain top. Our destination is Dead Horse Gap, a walk of about 10 kilometres. On the way up, I venture the yodelling chorus from The Lonely Goatherd and a man standing beneath our chairlift responds by opening his arms wide and hollering, "The hills are alive with the sound of music." Above the tree line at Rams Head range, we turn in slow Sufi-like circles, taking in the 360-degree views of the Snowy Mountains. The wise woman was right about the curative effect of horizons. I'm surprised she hasn't mentioned the benefits of yodelling, too. Then down we go along a gently winding track through silvery stands of dead gums. Fierce bushfires in 2003 have left these trees looking like bleached coral stranded thousands of metres above sea level. At Dead Horse Gap we climb a warm flat rock and have lunch, then walk back to the village along the Thredbo River path. Pairs of brown trout chase each other in circles just under the surface, inspiring us to take a gasping dip in the icy shallows. Day three involves a trip back across the state line to Victoria and a much-needed rest for our legs. Tom Groggin, west of Dead Horse Gap and close to the Murray River, is a popular camping spot. Four-wheel-drive vehicles can ford the shallow river there but as our car is a two-wheel-drive, we put on our swimmers, hoist our rucksacks and wade across the stony riverbed. The three of us lie under a shady tree and read books all afternoon. In between chapters we watch a kingfisher defend its territory against wattlebird incursions. On the drive back we stop at dusk and walk down into a grassy valley where a dozen wild brumbies stare in panic before taking off into the forest. Day four includes another tough climb. From the Guthega dam, at the confluence of the Munyang and Snowy rivers, we head north up a narrow overgrown path, looking for the trig point of the ridge. Sadness has sneaked back into my rucksack overnight and with every step it seems to be getting heavier. Just as my legs and lungs are about to go on strike, we reach the summit. There are those breathtaking horizons again, and not another human in sight. Yodelling is beyond me but smiling becomes possible. On our final day, we drive into town and find a shady park beside Jindabyne Lake. The weather is steamy and the water almost warm compared with the body shock of Thredbo River. I strike out towards the middle of the lake and tread water, looking back at the sun-bleached fields surrounding Jindabyne. Treading water: that's how you deal with grief. Not waving, not drowning, just waiting until you can catch your breath. Then you're ready to head back to shore. Jindabyne is a 580-kilometre drive from Melbourne and 460 kilometres from Sydney. Bimblegumbie guesthouse has summer season two-night stays for two people from $310, including breakfast. Summer season two-night stays at Bimblegumbie's "Little House", studio or bungalow cost $278 to $508 for two. Phone 6456 2185; see bimblegumbie.com.au. 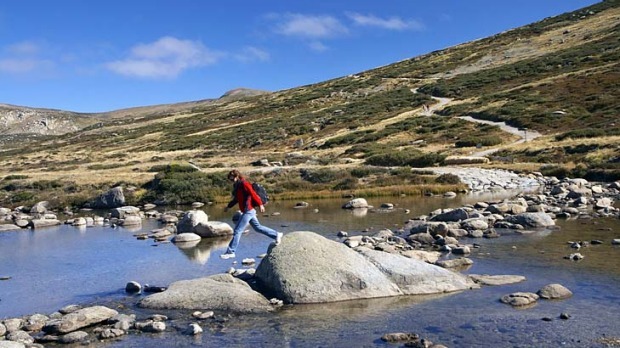 A day pass for entry to Kosciuszko National Park costs $16 a vehicle. See environment.nsw.gov.au/nationalparks. This site has maps and advice on alpine safety and what to take on walks. Maps are also available at visitor centres; see snowymountains.com.au.